Carebears may tell you that they refuse to obey the Code out of "principle". Their true motives aren't so high-minded: Greed, ignorance, and bot-aspirancy. ...And don't forget sheer madness. lepster101 cackled uproariously at our bumper Agent and then logged off, thinking himself safe. A few minutes later, his pilot-less 2.6 billion isk freighter was destroyed. How do such carebears react when they log back into the game? They still laugh, but smile no more. No sane carebear should hope to escape New Order justice. As evidenced by CODEdot's killboard, there are 20 trillion reasons to get a permit. Here's a sample from the week of September 13th @ 00:00 EVEtime through September 19th @ 23:59 EVEtime. Agent Kirra Tarren was busily assisting highsec incursion runners with his Svipul when Dr Longbow, a Machariel pilot, offered him a duel. Longbow must have assumed his battleship was more than a match for our Agent's tactical destroyer. But our Agents know no fear, and they love to shoot ships that shoot back, so Kirra accepted the duel. Suddenly, the Machariel pilot activated a kill right on our Agent, and instructed his fellow incursion runners to join in. Who would win this test of strength? The New Order, of course. Down went the 2.2 billion isk Machariel. Forget the Svipul; Code beats battleship any day. As for the rest of the incursion fleet, they failed to assist their fellow rebel. They sat back and let him die. Rebel pride, right? 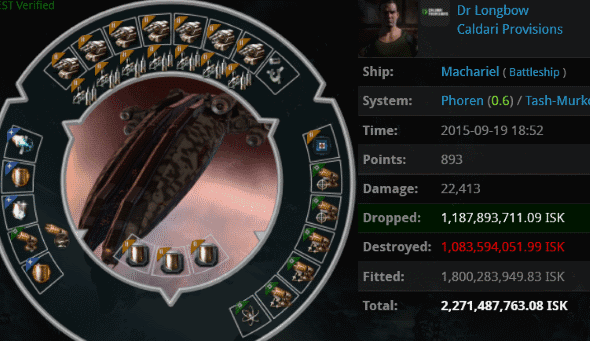 In a rage, the Machariel lost 3 billion more isk. 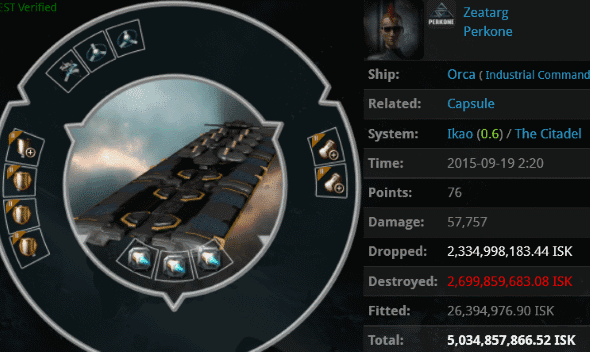 Zeatarg wanted to lose a lot of money while hauling, but didn't feel like using a freighter. The solution was a cargo-expanded smartbombing cloaky Orca. Agents AeleDeux, John E Normus, Lisa Tears, Annah Tsero, Lament von Gankenheim, karma balancer, Nitetime Video, reaper Shardani, TheInternet TweepsOnline TheInternet, Noll Kion, Samuel the Terrible, Yabba Dabba Do, loyalanon, and River Beacham zapped the Orca and the carebear's 5 billion isk was promptly redistributed. 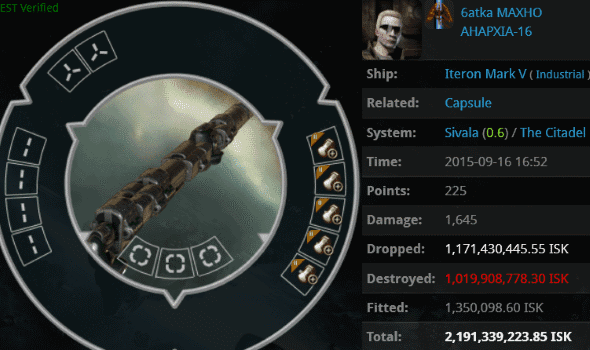 6atka MAXHO took the cake with his 2.1 billion isk anti-tanked industrial. Agent Jason Kusion only had to inflict 1,645 damage points before being treated to a glorious explosion. So much for the industrial EHP buff. 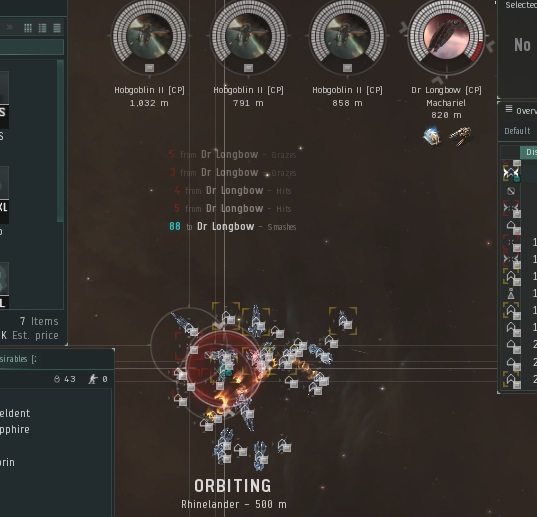 CCP, next time you want to help these guys avoid suicide ganks, try giving carebears the Code instead of a buff. It's much more effective. 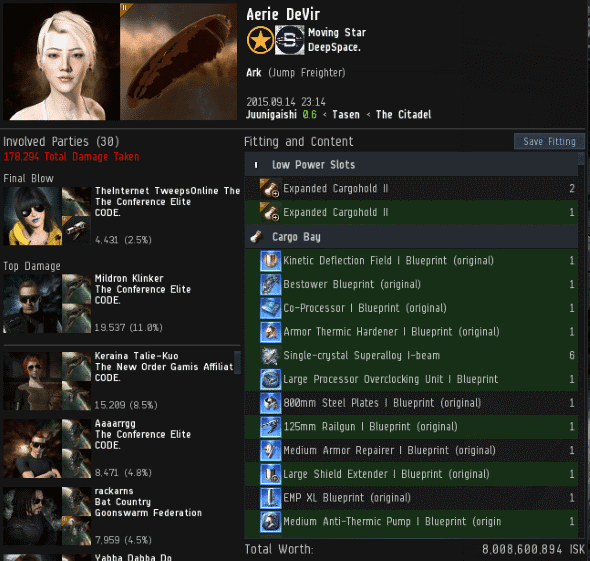 No doubt about it, Natasha Noud's 1.3 billion isk Hulk was astonishing. But you might be wondering why there are two killmail links listed above. 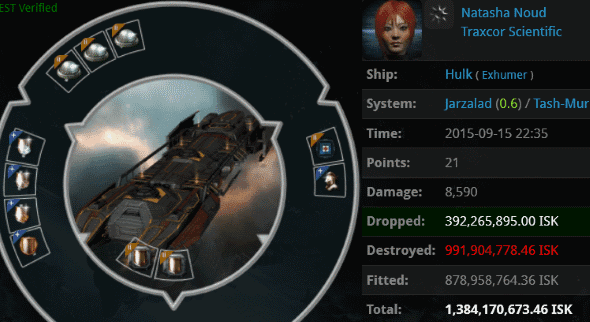 Brace yourselves: Nadya Yazria also lost a billion isk Hulk at the very same time. The decadent pair of carebears were simultaneously ganked by Agents Marina Gankalot, Rick Therapist, Carebears' Nightmare, Brutal Anna, Salah ad-Din al-Jawahiri, Lisa Tears, ECTb 4O, and Mamashke Privet. Aerie DeVir apparently needed a lot of space for her library of BPOs. This kill, valued at 14.5 billion isk on zKillboard, should be a lesson to all jump freighter pilots: If you survive jump fatigue, you still need a mining permit for highsec. You might say that there's an immediate "bot-aspirancy fatigue" that goes into effect when you enter high security space. It doesn't wear off after a month, though. It only goes away when you comply with the Code. There won't be any iterations on this system, so adapt now instead of waiting for fixes. Agents Mildron Klinker, Keraina Talie-Kuo, Aaaarrgg, rackarns, Yabba Dabba Do, John E Normus, Krominal, Bob Painter, Lament von Gankenheim, Salah ad-Din al-Jawahiri, Sterling Cohenberg, Dagny Whitemane, Nikonor Drishenko, AeleDeux, loyalanon, Globby, Sherman Cohenberg, Maddie Mcbumplug, Pod-Goo RepoWoman, Radric Davids, Sophia Soprano, Latir Darkspear, Stein Cohenberg, TheInternet TweepsOnline TheInternet, Silvester Cohenberg, Molly Klinker, Cheech Duff, Stanley Cohenberg, Hek Arbosa, and Major Bowel Discomfort showed remarkable courage and elite PvP ability when conducting this gank. Highsec is in good hands. 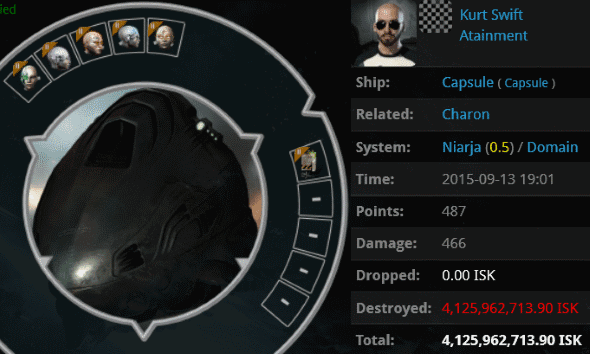 Kurt Swift stuffed his fat pod full of 4.1 billion isk in Ascendancy implants. Supposedly these implants improve your warp speed, but it's hard to take advantage of that when you're too AFK to go to warp in the first place. Agent holdmybeer popped this pod after it was liberated from its pilot's 7.6 billion isk freighter. Go as fast as you like, but there's no escaping justice. Another week of victory for the new order of highsec!!!!! Just pondered over that 20 Trillion Isk bit. Twenty - Trillion - Isk. Staggering. Well done CODE, well done everyone. What? no mention of the code losses? I don't see how that is a CODE. loss. Looks more like a hauler to me. These kills are feats of extreme bravery showcasing the best PVP prowess of the week. Not ganging up on a suspect hauler. obvious code alt is obvious. And the Glorious Code moves ever forward to unstoppable victory. AG can only offer token resistance at best. For the glory of James! Token resistance = staying docked and calling us all goons, then grrrr-ing at us. That drlongbow is a shitlord of the highest order, his tearz are epic. running afk incursions is the best way to get as rich as a lawer... CCP should develop the API to include how badass you can be in an incursion. Code can gank all day but they can't make isk afk ganking.